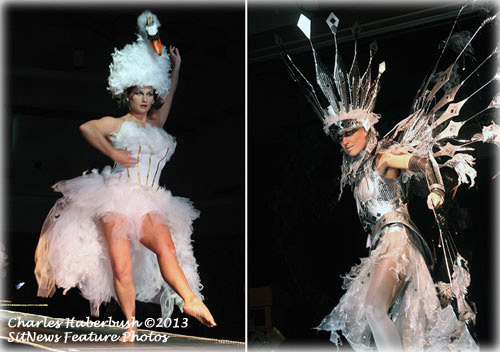 Re-invent was the theme of the 27th Annual Wearable Art Show which was held January 31st - February 2nd. Pictured above are two of the 47 entries in the Ketchikan Area Arts & Humanities event. On the right, Caity Widness models Ann Froeschle's piece "Lost Connection". On the right, Elizabeth Avila models Susan Heisler's piece "Swan Shake". Alaska: House Republicans Repeal Citizen Initiative; GOP bill would discharge cruiseship sewage in Alaska waters - Today House Republicans passed Gov. Parnell’s bill to allow discharge of sewage and untreated wastewater in Alaska waters, repealing a provision of the 2006 citizen initiative that protected Alaskans’ health and state fisheries. Alaska Democrats aren't pleased and say Parnell’s bill would allow the release of approximately 1,064,448,000 gallons of sewage and wastewater into Alaska state waters every year. House Republicans rejected Democratic amendments which would have required disclosure of the location of sewage discharges and protected Alaska fisheries from sewage discharges. “We want Outside tourists’ money, not their sewage. Alaskans voted in 2006 to protect our waters and the salmon fisheries that depend on them. It is outrageous that Republicans would repeal that citizen initiative on behalf of a few Outside interests,” said Mike Wenstrup, Chair of the Democratic Party. Ketchikan: Open House Planned for Streets Improvement Project - The Alaska Department of Transportation is beginning a project to reconstruct a highly traveled segment of South Tongass Highway from Grant Street to Deermount Street - locally known as Front Street, Mill Street and Stedman Streets. This area is located in the central tourism area of downtown Ketchikan. The project team will kick off its work with an open house public meeting in Ketchikan on Wednesday, February 6th, at the Ted Ferry Civic Center from 4:00 pm - 7:00 pm. Project Manager is David B. Epstein of the Alaska Department of Transportation Southeast Region. Alaska: Protecting Habitat for Salmon Lands National Recognition - Coordinated action to conserve coastal habitat in Southcentral Alaska has captured national attention. On Thursday February 7th at the Alaska Forum on the Environment conference scheduled to be held at the Dena'ina Convention Center, Special Assistant to the Secretary of the Interior for Alaska, Pat Pourchot, will present the Matanuska-Susitna Valley Coastal Conservation Partnership with a 2012 Coastal America Partnership Award on behalf of the Obama Administration and Coastal America. Coastal America selected the Alaska partnership to receive this national award for its outstanding efforts to voluntarily conserve more than 6,000 acres of coastal habitat important to Pacific salmon and other wildlife. The Alaska-based effort is one of only four collaborative teams throughout the Nation to receive this prestigious award in 2012. Coastal America (CA) was established in 1992 to conserve and restore coastal watersheds throughout the United States. Coastal America protects the Nation's coastal resources by integrating federal actions with state and local government and non-governmental efforts to pool community and agency expertise to leverage voluntary conservation actions. DANNY TRYEE: Say 'Yabba Dabba Don't' To Neanderthal Clones - If you're the average person, you say things like "I wish they'd bring back 'ABC's Wide World of Sports' and full-service gas stations." If you're more like Harvard University geneticist George Church, you say things like "Wouldn't it be a hoot if someone brought back the long-extinct Neanderthal caveman species?" Church (whose research in the Eighties laid the groundwork for genome sequencing) told Germany's "Der Spiegel" magazine of his hopes for taking DNA from Neanderthal fossils, synthesizing additional DNA, creating Neanderthal embryos and putting them in a Homo sapiens womb. Church is tantalized by recent anthropological discoveries that Neanderthals weren't just dumb animal-like brutes. In many ways they were just as civilized as modern man — maybe even more so. Neanderthal mothers had sophisticated culinary skills, employed cosmetics and DIDN'T THROW OUT THEIR KIDS' OLD COMIC BOOKS. Church thinks that the different brains of the Neanderthals would bring a fresh perspective for global problem solving, but that's not as upright as it sounds. "Hey, Mr. Neanderthal, I'd like to pick your brain" would segue into "And while I'm at it, I'm like to pick your living quarters, your mate, your occupation, your curfew..."
The neo-Neanderthals would live their lives knowing they were guinea pigs and freaks. They could read the writing on the wall — or at least the drawings.